Cashwiz, a company that offers that service, opened their doors on Monday. Located on the first floor of the building that formerly housed Square Deal Shippers on Sharpe Street, CashWiz will provide customers with cash on the spot for items that are approved for purchase by the company. “We are your trusted immediate source of cash. We buy anything that is of value. So, if you have something for sale, we will ask your price and we have our system that we use to value that item,â Cashwiz general manager, Andrew French told SEARCHLIGHT on Wednesday. 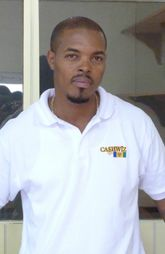 French explained that apart from buying items from members of the public, Cashwiz offers Vincentians the opportunity to purchase items at “reasonableâ prices. For persons who are unable to pay for an item being sold by Cashwiz, a layaway plan is available. Another option is a consignment. In the case of the consignment, if an individual has an item for sale and Cashwiz cannot meet the required amount, the seller is given the opportunity to have Cashwiz sell the item for the suggested price. However, 25 per cent is kept by the company. The most interesting service outlined by French is the Buy Back option. “For example, if you have a cell phone worth $1,000 and you donât want to sell it, but find yourself in an emergency where you are in need of $500, then you can bring the item to Cashwiz. “We will then give you the $500 and keep the phone in storage, with a $25 fee on every $100 dollars given by Cashwiz. The customer is then given 30 days to repay the funds. If unable to pay at the end of the deadline, a request can be made for extension. “So, we basically buy your items from you in this case, but we are not going to sell it,â he explained. Since opening their doors on Monday, French says the response from the public has been “great,â as many people have been taking advantage of the opportunity to earn cash from unwanted items. The general manager, however, issued a stern warning to persons who intend to sell stolen items not to do so, as Cashwiz will not tolerate such actions. Persons seeking to conduct business with Cashwiz are required to carry one piece of identification and be prepared to have their finger print taken. Their name, address and telephone numbers will also be requested during the transaction process. “We try to offer a really good service, where as we try to buy items at a cheap price and resell them at a cheap price as well. “So, you walk in to the store and whether you are rich, middle income or lower income, you should be able to purchase something,â French added. Open Mondays to Fridays 9 a.m. to 6 p.m. and on Saturdays 9 a.m to 4 p.m., Cashwiz buys items such as gold and silver jewellery, electronic items, and vehicles. Items not on the purchase list include stoves, fridges, and microwaves.